Nigel Short has been competing at the top level for 5 decades and counting. During this time, he’s beaten every World Champion from Karpov to Carlsen, and become the only Englishman to have challenged for the title, taking on Kasparov in their controversial 1993 match. His razor-sharp, creative tactical ability has been a major factor in his success. 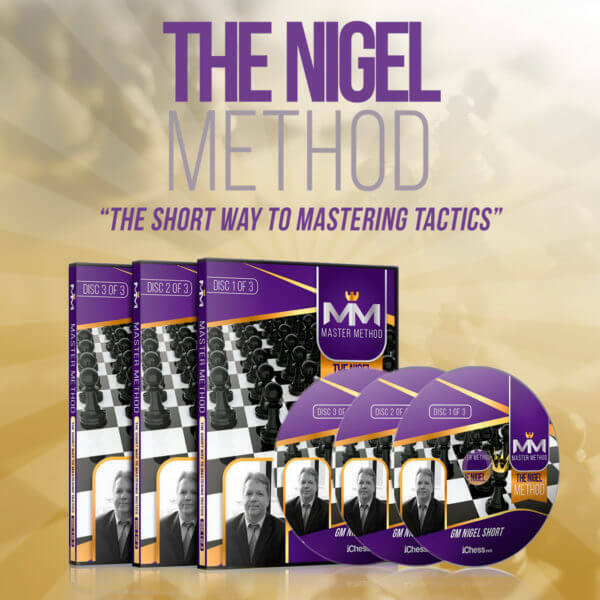 And now you can learn how to improve your tactics from Nigel himself in his stunning 15½ hour iChess's Master Method. Drawing on 40 of his most instructive games – and humbly including a few losses – Nigel reveals how rich, tactical positions are created and how to calculate the winning lines. Magic demystified: What would you play in this crazy position against Yasser Seirawan? Nigel explains how to ignore the noise and find stunning moves like his …Nb4!! The spirit of gambits: No opening theory, just Morphy-esque moves! Short is a big fan of the Evans Gambit and reveals how he used it to beat the then FIDE World Champion Ponomariov in their secret training match in 2003! Dueling Karpov: When Nigel beat Karpov in the Candidates semi-final, he prevented an 18 year run of Karpov appearances in the World Championship final. Get the inside-track on their match including the stunning 5th game with Nigel’s memorable knight sac. Nigel has split his chosen games into 7 categories, including Attacking the King, Tactical Awareness, Defensive and Endgame Tactics. By challenging students to find the strongest moves and explaining the mechanics of the combination GM Nigel Short shows you how to improve both your calculation and pattern recognition, transforming you into a master tactician! And Nigel’s fascinating anecdotes make this a must for any lover of chess history and lore too! This 15.5-hour course of Nigel analyzing the most instructive tactical battles he’s ever been in. Tal, Korchnoi, Karpov, Kasparov – Nigel has faced them all. Hear Nigel describe what it’s like to play these legends and discover how to think at the very highest level in chess. Access to online tactical tests: 5 tests, each with 20 tough questions, feedback if you get them wrong and a score at the end of it! Rare footage of Nigel and key highlights from his World Championship match against Kasparov! 7 PDF puzzle sheets with full, descriptive answers. is an English chess grandmaster, chess columnist, chess coach and chess commentator. Short earned the Grandmaster title at the age of 19, and was ranked third in the world by FIDE from January 1988 to July 1989. In 1993 he became the first English player to play a World Chess Championship match when he qualified to play Garry Kasparov in the World Chess Championship 1993 in London. The video is an instant download. There is no shipping involved.